13 February 2018, Hong Kong – Start Options CFO, Mr. Felix Logan congratulated Bitcoiin2Gen and Steven Seagal for their cooperation. Bitcoiin2Gen has named Hollywood action star Steven Seagal as their brand ambassador. 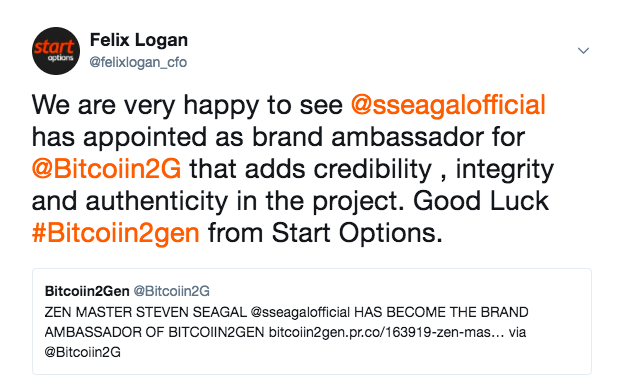 Mr. Logan also tweeted, this cooperation between Bitcoiin2Gen and Hollywood Star Steven Seagal will bring credibility, integrity, and authenticity to the project. Steven Seagal is an American actor, producer, screenwriter, director, martial artist, and musician who holds American, Russian, and Serbian citizenship. Steven Seagal is a man of diverse character whose spiritual beliefs and humanity are woven into every aspect of his life. Most of us know Steven for his roles as an action hero, Call it an obsession or a calling, but Steven mastered Martial Arts at an early age, becoming a 7th-degree black belt and Aikido master. His films include box office successes such as Hard to Kill, Marked for Death, Out for Justice, Above the Law, Under Siege, Executive Decision, The Glimmer Man, and Exit Wounds to name a few, are all loved for their storylines and fast-paced Hollywood action. Most importantly, it is his genuine care for others that drives him to unselfishly give his time and financial support to many charities across the world. His support of environmental causes, animal rights, children in need and HIV/AIDS efforts is undeniable and an essential part of his daily schedule. Steven Seagal is a versatile talent and an intricate human being, whose passion, selflessness, integrity, and character are embodied in his work. Start Options is one of the world’s fastest growing Progressive Bitcoin Mining & Crypto Currency Trading, offering powerful yet user-friendly, in-house trading platforms for web and mobile to trade hundreds of assets – crypto currencies, commodities, stocks and indices. Start Options CFO, Mr Felix Logan said this cooperation between Bitcoiin2Gen and Hollywood Star Steven Seagal will bring credibility, integrity, and authenticity to the project. "Start Options is excited to announce a new program with the latest cryptocurrency Bitcoiin2Gen (B2G). In this program, every investor who will buy Bitcoiin2Gen (B2G) coins will take an advantage of “Buy 1 Get 1 Free” in the period of 90 days." Start Options CFO Mr Felix Logan said "Bitcoiin 2Gen looks as if it will be next big thing and we are on board."